Since moving to the Pacific Northwest, Seattle has become my favorite city. There are so many things to do and see there. Mike and I recently spent the afternoon browsing Pike Place Market. I love the unique sights, sounds and smells of the Market. The beautiful flowers, colorful fruits and vegetables, the fish market as the guys chant and throw their fish to the customer. There are smells of delicious things baking and the music and antics of the street performers. 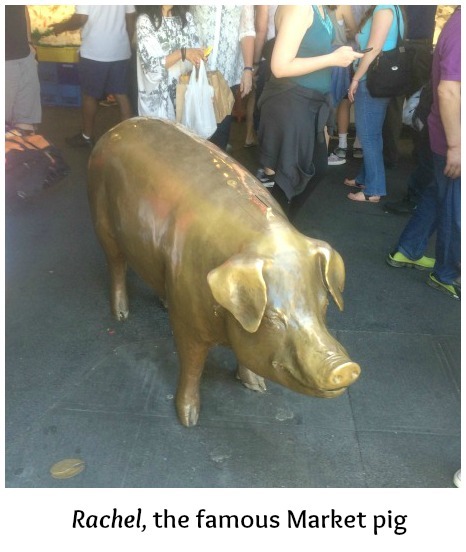 As you enter under the Market clock you’re greeted by a life-size bronze piggy bank named Rachel. 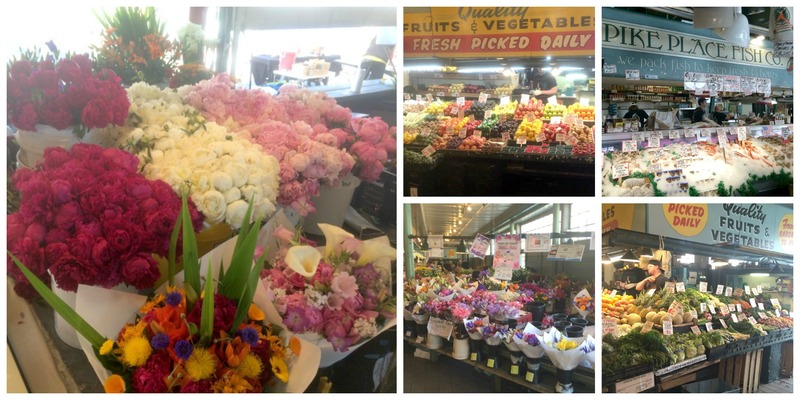 Pike Place Market is truly a Seattle landmark welcoming more than 10 million visitors a year. Before the market, farmers brought their goods to the city by wagons and by ferries from nearby islands. Wholesalers purchased their goods who then sold the goods at a commission. Many farmers barely broke even or often lost money. In 1906-1907 the price of produce soared and the public grew angry over the price gouging. The Market was created to provide a public market place where farmers and consumers could meet directly to sell and buy goods and eliminate the wholesalers. Can you imagine the excitement on opening day, August 17, 1907 when crowds of people showed up to find bargains and purchase fresh produce! The first farmer is said to have sold out within minutes. 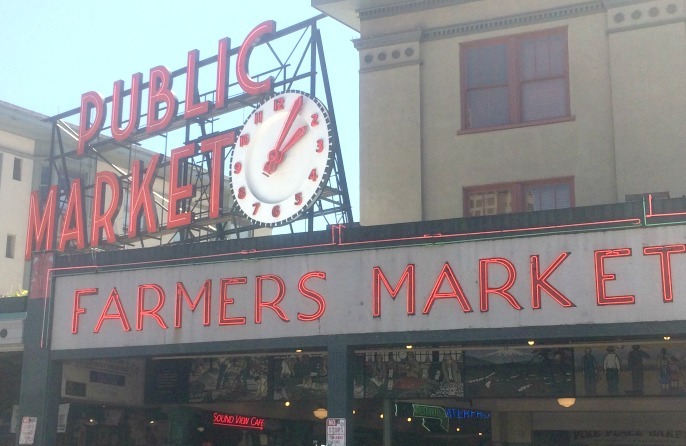 Today Pike Place Market remains the place to “Meet the Producer”. There are more than 85 local farmers that supply Washington -grown fresh fruits, berries, nuts, vegetables, herbs, flowers and honey. You can also find a great variety of fresh quality meats, seafood, milk and dairy products. The Market is home to many specialty food stores with items from around the world. One of the country’s largest craft markets is located in the Market. There are 225 craftspeople selling their unique, Washington-made crafts here. This is a great place to find a unique gift for someone special or maybe just something special for you! If by some chance you don’t find what you’re looking for in this area you may find something in one of the many small owner-operated businesses. There are so many streets, alleys, lower levels and nooks and crannies to explore. You can also stop by the very first Starbucks for a cup of coffee. After an afternoon of browsing the market, we stopped in for lunch at The Pink Door. There is no signage and no advertising for The Pink Door, only word of mouth. It opened in 1981 and is always a busy place so I suppose that speaks for itself. Take a walk down Post Alley and look for the “pink” door! 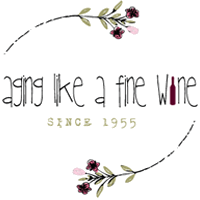 The Pink Door serves Italian-American food which we’ve always experienced as delicious and the service has always been great. They also have free live entertainment, featuring trapeze artists swinging over the quests in the dining room. We enjoyed eating lunch on the patio area overlooking Elliot Bay. 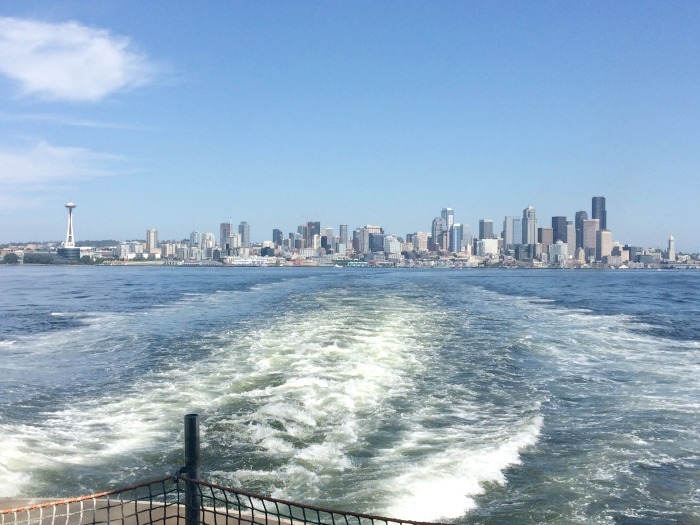 Finally, a ride home on the ferry with an incredible view of the Seattle skyline. I’m never disappointed in a day spent at the Market and I never come home empty handed.